Raw silk sherwani is richly decorated throughout. Comes with a golden kurta, shalwar or churidar pajama. Decorations made with kora, naqshi, beads, stones, swarovskis, marori thread kamdani and resham.Made in Pakistan. 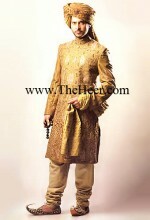 Click the button below to add the SW884 Golden Jamawar Sherwani to your wish list.